Together with other families spend a perfect holiday away from the slopes of Schladming! Escape the hustle and bustle on the slopes and discover new corners of our wintry mountain landscape as you try out different sports under professional guidance. Here at Bliem's Familienhotel a variety of activities including snow-shoe hiking, joint excursions across the ski region, moon-lit tobogganing and horse-drawn sleigh rides complete the offer. Enjoy the magical winter wonderland at your own pace, pause for a rest in quaint mountain huts and capture the beauty of the Schladming-Dachstein region from a different perspective. 1 or 2 times a week we offer guided snowshoe tours with junior director Katharina who, depending on snow conditions, takes you to beautiful places. The guided tour is free of charge, snowshoes are available at the hotel (€10 rental fee). For children from age 3 and adults. 2 - 8 people per group. Sturdy hiking shoes are essential! Romantic sleigh ride through the snowy winter world! 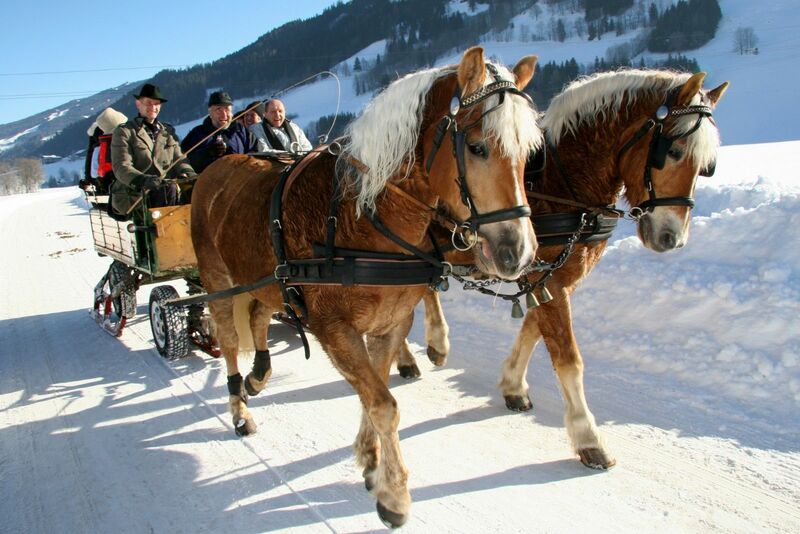 A romantic horse-drawn sleigh ride through snow-covered forests is truly a unique experience for families with little children.